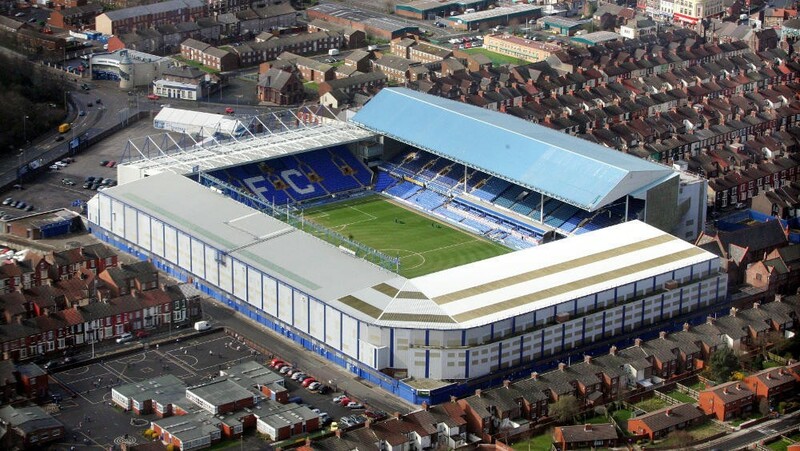 Goodison Park is a large but old stadium that will become victim to clubs modernisation in recent years. Everton have bought land at Bramley Moore Dock and are looking to build a new 50,000 seater stadium there. From the very top of the main stand, you are able to see Stanley Park and their biggest and nearest rivals’ stadium Anfield. Train: Kirkdale Railway station is about a mile away from the stadium, however Sandhills Railway station may be easier as busses run from this station to the stadium 2 hours before kick-off and 50 minutes after. Car: From the M6 exit at J21A. Follow the M62 until you reach the end of the motorway and then follow the A5058 ‘Queens Drive’ towards Liverpool. At the roundabout junction with the A59, turn left into County Road. Just under a mile down the road, turn left into Spellow Lane then left again into Goodison Road. Go left at the lights into Utting Avenue and then a mile from there turn right at the corner of Stanley Park into Priory Road. Parking: If you are there 2 hours before kick off there should be sufficient car parking in the streets surround the stadium. Always be wary when parking of any permit only areas or restrictions. There is an alternative to park in Walton Lifestyle Sports Centre (L4 9XP) for about £7. It’s about a 15 minute walk from here to get to Goodison Park and you avoid traffic from Stanley Park. You can also park in Anfield or Stanley Park for £8. There is a home fans only pub called the Royal Oak so avoid that at all costs. There’s a small outdoor fanzone that sells alcohol and food to both sets of fans, so if you are feeling sociable and fancy a drink and food with some Evertonians there’s your place. The Thomas Frost Pub on Walton Road is about a 15 minute walk away from the ground which is a Wetherspoons pub, and you can never go wrong in there as they sell alcohol and food in all of their pubs. Further down from there is a wine bar called Bradley’s which is family run but also sells beers and real ales. The Arkles pub, mentioned in the Liverpool away day article too, is a popular pub for visiting fans and is 10-15 minutes from Goodison Park. Please note that the stadium staff do not allow food or alcohol from outside to be taken into the stadium. As always have a safe journey and enjoy yourselves. This is a crucial game so get behind the lads and show your support. If you aren’t attending you will be able to keep up to date with @WestHamWaycouk on Twitter!